Following up on a thread I posted back in the summer - My 1998 red SH needs paint. I have fading on the front finder and tail. I love my SH but at this moment I am not going to spend the money to get a professional respray (not that she doesn't deserve it, it's just a bad time). I am going to try to make her a little better on the cheap. Yes, I know it will not match perfectly. Nothing will. The tank and fairings are great, but the tail and fender need more than buffing (I know, I have tried). Hey, it looks like crap now, so I don't have much to lose. I have a bit of experience with paint. I have done several rattle can things in the past (going from abysmal on the first job, to quite good on the last one - people tell me it looked professional). I have even HPLV'd a car in my driveway to decent effect (again not perfect, but it was a mud-truck so it didn't need to be). I am not a pro, and do not pretend to be, but I know the value of proper prep work, tack cloth, and a how to get a good wet pass down. What I would really like to do is find a *good* match in Duplicolor (or some like paint). Lots of others on the forum would too (or least that seems to be the case from my searches. I know it will not be perfect. My SH isn't perfect either. If I cannot find a good match, I will go to Colorrite (I have used their stuff before). It is stoopid expensive, but works pretty well and is good paint. I bet we can could find a good match if we put our experience together. I am going to test these. I would love input from other who know colors that match or DO NOT match. Remember - Our bikes are old and faded to different degrees. Nothing but a complete respray will be perfect. Lets find out some good matches! Why not bring your side fairing to an auto parts, scan it, and have the paint put in a spay can ? I don't know in the US who can do this, perhaps NAPA or someone like this, but, will not set you back that much more, and, you'll be sure the have the right match. I could try it, but in my experience, those never match either. Plus, getting a custom mix will throw me into Colorrite price territory for sure. 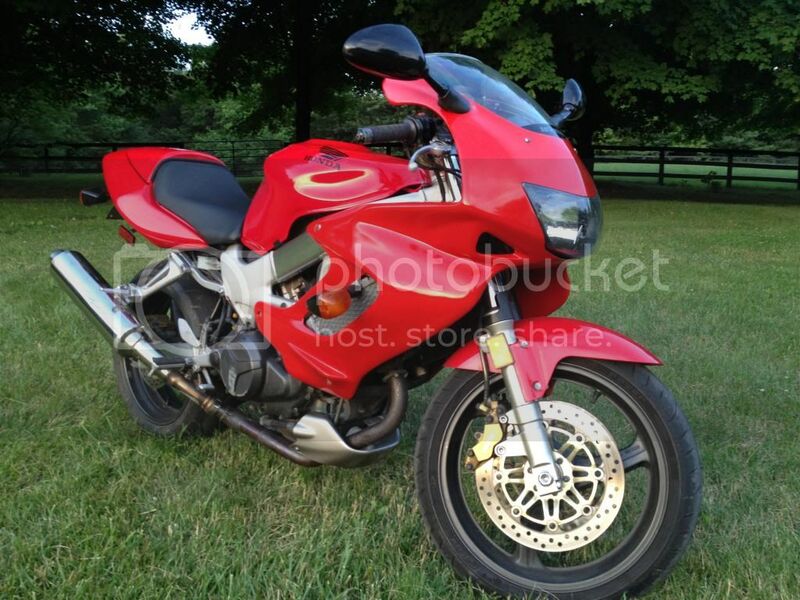 I really want to find a cheap solution for Honda R157 "Italian Red". I have been searching for weeks, and there are literally hundred of posts looking for a solution (many VFRs are this color as well) but I have found next to nothing saying, "Yeah, this isn't perfect but it is close." I know, with all the VFRs, Ducatis, Supras, MR2s etc. that were produced in this period, with a very similar spectrum of reds, there has to be one that will be a pretty close match. I am not looking for a forever solution or a perfect solution, just a cheap "anybody can go to their local auto parts place and grab one" solution. I think it is out there. It's not the right solution for everyone, but I think many people would like to know. I'll be done the same with VHT for case paint. But, the red is first. Last edited by Wicky; 01-14-2014 at 10:16 AM. I wanna see how this result comes out... Post pictures! I'm down to paint my fairings too if this is good. I definitely will... there's a lot of interest in the R157 color, just no info about stuff that matches pretty closely. I know it will not be perfect, but just about anything is better than what I have now. Toyota Super Red II is a leading contender right now. I park beside a Ducati from the same period at work. The similarity in color is striking, and lets face it, we know what Honda was doing when they built this bike. The color is called "Italian Red" for crying out loud. Anyway, many people swear by the Toyota Super Red II for Ducati from the same period. It may not work, but that's where I plan to start. I will post pics, but it may be a couple of weeks before I settle on a color and do the work. Wicky - that looks really good! Hope I can do as good a job on mine. Yeah, I have used Colorrite before, and to good results. I am not knocking them at all, except they are crazy expensive. To get enough paint to do the front fender and tail, with base, top, and clear, it's like $150. I am looking more in the $20-30 range. Funny the Scion FR-S in the ad above looks like a pretty darn close red too. I better look that one up as well. For what it's worth I had a new '98 Superhawk back in '99 and my buddy had a new '98 916 and the colors were nothing like each other. I mean they're both "red" but... I haven't done the red but I did rebuild a crashed yellow '99 and after doing the bodywork myself had a local body shop shoot both side fairings and the tail and it wasn't more than about $200. Though not PERFECT they did a very good job of matching what I would think is a very difficult color-the yellow with the flake in it. And I'm very **** about that kind of thing too. Still got the satisfaction of doing the bodywork and everything else myself but got it sprayed on the cheap with professional quality paints and results. Applied the factory decals and it was pretty much impossible to tell from brand new. One other thing worth looking into (though I can't help colorwise) is a new product from Eastwood called "2k Aero Spray," which promises "durability and precision of a 2-part urethane without the paint gun." $20-$30? If you do great prep, let it dry long enough and wet sand and buff it it can LOOK perfect, but I'm sure the durability will suffer. My 2 cents if I were going to spend all that time to do the body work and all the prep for paint I wouldn't waste my time covering it with spray paint. And with regards to colorite, I did the math and it would've cost as much just to buy the stuff (and still have to spray it myself) as to have a professional just spray it for me. I get it - I know it isn't too much $$$ to have it sprayed. And I probably will one day, but this is the intermediary until that day. No, I wouldn't try to spray my a part of my tank and have it match, but the tail and fender? Sure. Worst case, is that I mess it up and then go get it sprayed. I ma out an extra $20 and a couple of hours, not the end of the world. I have sprayed 2 stage Urethane from Colorrite with a Harbor Freight HPLV gun, and it was fine. Had a bit of orange peel (not bad), and 95% of people who walked past the Rover I shot with would not notice I wasn't part of the original paint job. But it was probably $400 to do that right (with all the paper, cloth, gun, paper, primer, paint, clear, paper, etc.). That's the rattle can challenge! There's got to be a better way that spending $150 to get some Colorrite that may not match anyway (my bike is 15 years old, exactly how faded is it?). Painting is much more about prep and following good technique than who does it or what you use. Have heard really good things about 2k… that guy's tutorial says if you let it cure for 10 days, you can come back, sand with 1000 grit, and have the 2K as the top protective layer. I may try it. I feel ya, I'm all about fixing stuff up on the cheap. I haven't looked into the new paint from Eastwood so I'm curious how the price stacks up. I can't imagine it's cheap, I know Eastwood makes good stuff. I know if you prep, spray, wetsand and polish correctly you could get fantastic results with spray paint, but is the paint as "hard" as what comes from a spray gun? Someone on the forum said Rustoleum Chinese Red lacquer was a close match to Italian Red, but I've not been able to find that anywhere. I have a yellow undertail I need to paint red, so I'm interested how this turns out. 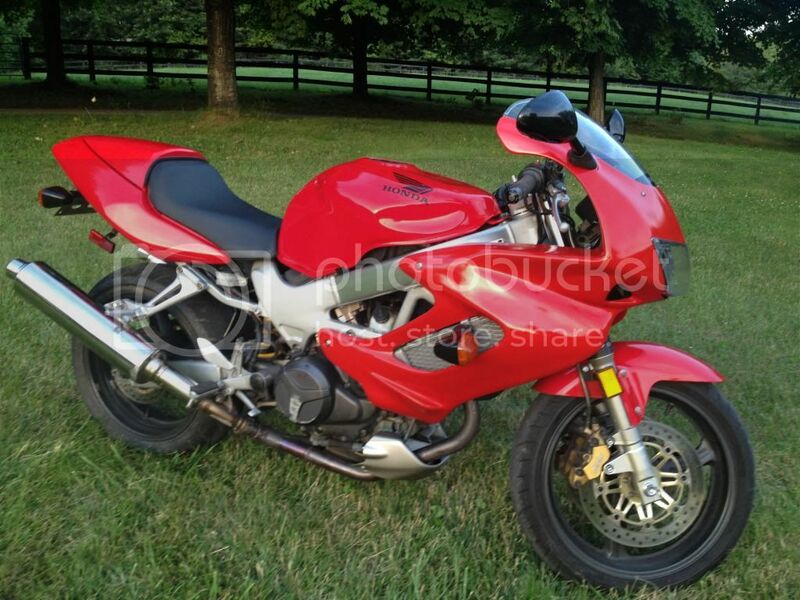 I went through the same thing last year when I was selling a red 1998 that had an unpainted upper fairing. I thought mine turned out very good considering all that I read about how hard it is to match. I was lucky to find the receipt, I bought this paint at Salvo auto parts, it is their Perfect Match brand paint in FLASH RED. I think I used 3 cans on just my upper, and I would have been better to have 4 and get better coverage on the last coat, I remember I was running low. You should get 5-6 if you're doing a fender too. I remember when I was reading about matching Italian Red, people had commented that Honda's combination of primer, base color, and most importantly the clear which has a pearl in it is very hard to match the end result even with professionally matched color. I think maybe it turned out a little more orange than the rest. I had tested 3-4 colors I found and this was the best match. Last edited by 98VTRrider; 01-14-2014 at 11:55 PM. Wow - that looks like a pretty good match. I will be pressed to do any better. Of course, we have no Salvo Auto down here in North Carolina… but it gives me hope. I will try to find out who supplies their paint. Captain Chaos - it will definitely not be a good as Urethane through a gun. That stuff is amazingly bullet proof, if about 20 minutes. I got some on a measuring cup (shhhh, don't tell the misses). After after about 5-6 years of use, dishwashing, etc. the drop of paint is untouched. I would never try to rattle can the tank either… that would be asking for trouble. Just checked, Duplicolor has a "Flash Red"… guess that is on the list too. Last edited by Skidmarkart; 01-15-2014 at 05:20 AM. I did this my Bandit 600 recently, and had exactly the same dilemma as you... where to get the right color without paying $80 for a spray can. I went to Walmart, and in their auto section they had red, white, black, and clear. I bought a can of the red, and when I tested it, it was a perfect match for my Suzuki Bandit. (not for the SH tho...) I actually touched up battle scars on the frame and after it dried, I can't find which part was painted. Alright. Enough talk of these slow rattle cans of red. Who knows what about yellow rattle cans? What matches? And no cracks about how yellow always streaks 'cause it's so fast. We all know yellow is fast. Last edited by VTR1000F; 01-17-2014 at 11:39 AM. Reason: Spaces. First color test... Chrysler "Flash" red. Not bad, fairly close color, but not close enough. There's a bit more orange in there than should be. Next... Ford Cardinal Red - Looks a bit dark on the initial spray, but very close. Will update later. Last edited by Skidmarkart; 02-09-2014 at 05:05 AM. That doesn't really help me determine what rattle can is a good match for yellow. I thought I had steered this thread in the proper direction, but here we are back on red. Cardinal Red = too dark. Very close in color, but too dark when layered. The quest continues... next ??? Anyone have suggestions? Chrysler "flash" was closer. Going to try a couple options before I select. Quick Reply: The great RATTLE CAN paint challenge! Now EVEN CHEAPER!